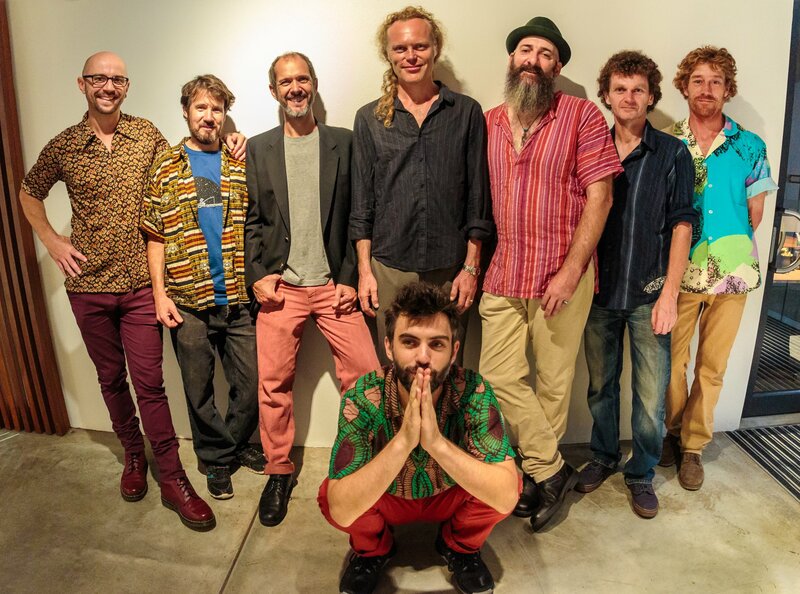 Timbuktu are a Northern Rivers NSW based 7-piece ensemble led by guitarist, vocalist and live-looper, Joe O’Keeffe. After living in France and the UK where there are vibrant West African musical scenes, Joe became strongly influenced by these rich and varied musical cultures. Drawing from the likes of Fela Kuti, Ebo Taylor, Ali Farke Toure and Thomas Mapfumo amongst many others, he writes original songs and creates arrangements from vintage 60s/70s tunes from the Golden age of Highlife to the rise of Afrobeat and Ethiofunk. The full line up of Timbuktu includes Joe O’Keeffe (guitar/vocals), Cam Smith (trumpet), Dave Stephenson (trombone), Brent Calcutt (keyboards), Anthony Mitchell (bass), Rod Evans (percussion) and Benji Keogh (drums).